Wouter Peeters triumphs in the shootout. 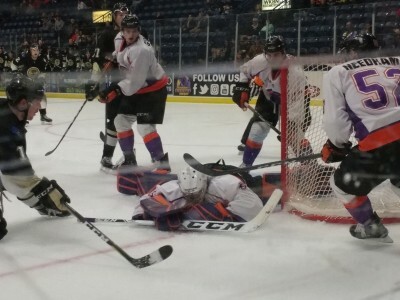 - Wouter Peeters stares down Marc McLauglin in a shootout as the Phantoms pick up a 2-1 win over Cedar Rapids. Well, I've been busy with work and other 'real life' obligations lately and haven't had a lot of time to put together articles. With the World Junior A Challenge going on and teams missing key players from lineups, it's hard for me to put together previews without time to do a little more research. I might have even skipped recapping yesterday morning's tilt against the Cedar Rapids RoughRiders but with so few witnesses to the event, I thought I had to post something. Yesterday was the "kids day" game where schools bus kids in for a fun morning off to see some hockey and we get to pad the attendance stats. That's the plan least, yesterday did not go according to plan. With a few inches of snow falling overnight, the schools opted for an overabundance of caution and canceled. The official attendance was 145 people. The game itself was an even, mostly defensive match. 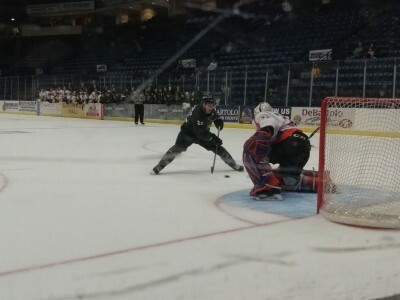 The Phantoms had the early edge in shots. They would get a couple powerplay opportunities midway through the first frame but it would be the 'Riders capitalizing on the second one. Off the faceoff, Mike Regush would take the puck and lay a soft pass to Michael Joyaux, too soft a pass. 'Riders forwaed Marc McLaughlin would intercept the puck in between them, poking it off the boards to the neutral zone and raced around a flatfooted Joyaux on a breakaway. McLaughlin would pick up the puck and go off on a break away. 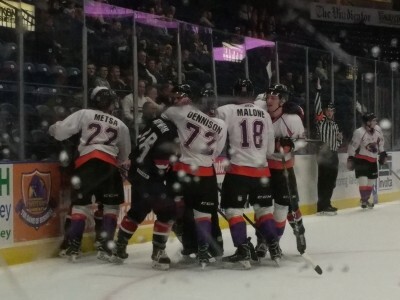 The Phantoms netminder Wouter Peeters came out to the top of his crease but did not even flinch as McLaughlin put a laser shot from the left faceoff circle over his shoulder popping the water bottle at 10:02 on the 'Riders 5th shot of the game. Shots were 13-7 after the first period. Scrum Together - The Phantoms and USA NTDP U17s engage in some pushing along the boards in the second period. The Phantoms finished out November a little better than the previous month. After a 2-1-1-1 start the Phantoms went 9-1-1-0 putting themselves in a tie with Chicago for top spot in the East. With only a Friday night game on tap, the Phantoms really wanted to put up another win at home and add points in the standings. This was going to be an interesting challenge against an offesivly charged NTDP U17 team that beat the league leading Fargo Force 6-3 the night before. For something that was supposed to be an offensive showcase, it wasn't. There was a lot of up and down action but defenses and goalies did their jobs well. The Phantoms outshot USA 12-6 in the first but neither team found the twine. It wasn't until the 11:10 mark of the second that someone would score and it was the Phantoms with the first strike. Alex Barber would intercept an exit pass from NTDP defenseman Drew Helleson at the blueline before they cleared it. He sent a pass to Chase Gresock in the left faceoff circle who rifled it past NTDP netminder Spencer Knight. The Phantoms would be outshot 11-5 in the frame leaving the total shots even at 17 all at the end of 2.